1. Buy in Bulk: Most grocery stores and markets have bulk discounts. 2. Freeze Sale/Bulk Buys: Buy out and freeze sale buys & bulk I don't immediately eat. 3. Shop Local Markets: Look for local produce markets to explore for savings. 4. Buy "Overripe" Fruit: Ripe and overripe fruit is cleranced out. Buy it & freeze to preserve. 5. Ask Friends: Friends may have overloaded fruit trees or garden goods and need your help eating it! 6. Forage: Hunt down wild fruit trees, berries, and herbs. Ask neighbors if could share, sell, or trade their harvest. 7. Community Gardening: Start a plot or try a will-work-for-food deal. 8. Avoid Organic: If you're on a budget organic isn't necessary for optimal health. 9. Avoid Trends: Likewise, trendy super foods and supplements aren't requirements. 10. Start a Garden: Growing leafy greens, herbs, and veggies in the back yard can yield huge savings. Tip: Frozen veggies are just as healthy, if not more so, than fresh ones. I love to stock up on frozen veggies to save money. You can throw them into lots of meals for a nutritional boost. In an ideal world I'd love to eat only organic and incorporate super foods, but buy what your budget permits. If you're on a strict budget, get what you can and don't feel guilty about it. 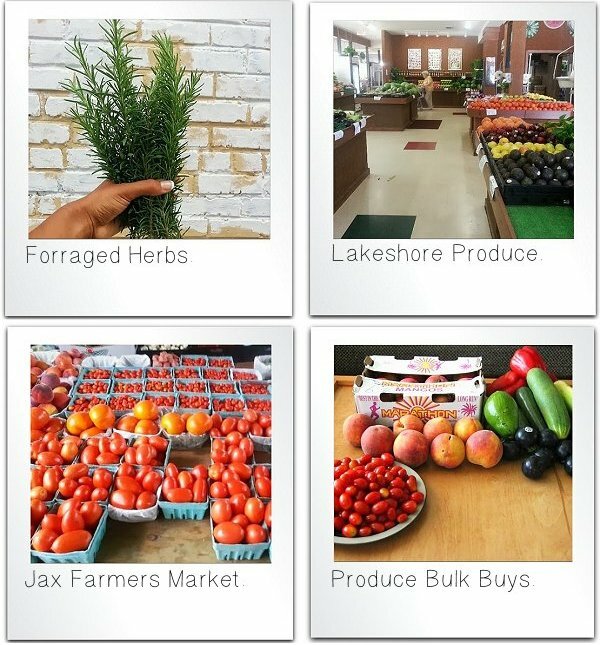 If you're in Jacksonville, Florida, markets I love include The Bargain House of Fleas, Lakeshore Produce, Ramona Flea Market, Riverside Arts Market, and Jacksonville Farmer's Market. I document veggie hunting/growing/preparing adventures on Instagram. Got any more tips on getting often-expensive produce at low prices? Do share your tips in the comments! Good tips! Sometimes frozen veggies are a real bargain. Thanks for the blog visit. Hope you get some creative time in-- best stress buster I know! It really is! I miss it, must schedule some more. i'm trying to eat healthier so this is super helpful. thank you! Do it! I hope it helps. Love this. Didn't you write about dumpster diving before, too? How about working for a farmer? I did for a little while, didn't keep it up for a few reasons. 1) Most of the stuff you can eat from it is processed or meat 2) You have to waste a lot of gas to do it. 3) Were were up at 1AM to 3AM doing it and meh, I'd rather sleep :) Buuut you can find amazing stuff. In my experience, I have noticed that local fruit markets are not worth the trouble. The prices are comparable or more expensive to discount grocery chains & the fruit always seems to be of lesser quality. I'd rather keep those grapes in my fridge for a week if needed than 2 days before they start to rot, thank you. A great way to get the lowest price possible without getting it for free is: price comparing & price matching. I personally live in an area where 7 or so fruit markets that I can recall when posting this, 9 chain grocers, 6 independent grocers are all within walking distance. Any given time one store seems to have all types of berries on sale & grapes. I don't personally give a crap about price comparing, though. People who dumpster dive food are brave. Kudos to you for stickin' it to the man & saving money. Oh yea, you guys get nice year round Farmers Markets in Jacksonville, don't you? Did I ever tell you about my only trip to Jacksonville? Walking distance (20 mins from my house). I wish I had the option to garden! Tried to one year on my balcony: what a flop! I've had the opposite experience with the more local bits lasting longer, I do now pedantically separate fruit/greens/other veggies in my fridge and it really helps everything last MUCH longer. Gave some links about on our dumpster diving experience above, only did it about a month because the hassle but wouldn't mind trying to again someday. Food waste makes me crazy. And nope you didn't tell me about your Jacksonville trip, how'd you like it? :D I must visit Toronto someday. Oh, aaaand I have one garden failure per year, this year our cherry tomatoes died prematurely when we neglected to treat wood we used as stakes and spider mites invaded from them and killed the plants. ;p Learn something new the hard way every time, but I love it! Got some leafy greens to plant next, hope they'll save me some money once they grow big. Thanks for the helpful tips as always! Thanks for the tips. I don't eat ANYTHING that I can't ID. Basically only certain herbs and blackberries. NEVER mushrooms! It's SO nice to read that it's perfectly fine not to buy organic given that it's more expensive. Of course I'm a huge advocate for organic food, but when you're on a tight budget it can make eating healthy more complicated than it needs to be. I love fruits and veggies, so I figure that as long as I get those in (organic or not) I'm doing something right. You do what you can, for some it's just a reality that organic will not fit in your budget no matter what you cut or what side job you do to earn more for food. Better to have non-organic fresh produce than no fresh produce!